Absolutely the Best Tasting Beef Lamb Meatballs EVER! Yes, I’m Italian. And yes, I’m partial to meatballs…especially when they’re in our homemade raviolis! But that’s something for another day. One of the things I learned from my Sicilian grandmother was to keep things simple in my cooking. And don’t give anyone your complete recipe otherwise people might eat their food instead of yours! But, again, that’s a discussion for another day. Here I want to get to the point of sharing everything is this simple yet amazing recipe. I wish it came from my grandma, but it actually came from an Asian colleague of ours! The key she shared with me is to mix one pound of grass fed ground beef with one pound grass fed ground lamb. I knew lamb had a lot of good fat – side bar: fat does NOT make you fat! Good fat, like animal fats, avocado, olive, coconut and sesame oils are great for your brain health and every cell in your body! If you ask my husband, Dr. Mark LeMay, DC, ACN about fat be prepared to sit and listen awhile, because he’ll set you straight on the MANY benefits of fat and how we should not live without it. WHERE’S THE BEEF?! Okay, yeah, back to the recipe. I LOVE my Kitchenaid mixer, so I basically threw everything in there and let it do the work. If you like getting your hands dirty and slimy, have at it. After you’ve mixed things well, about 2 minutes is really all it takes on the lowest setting, it’s time to form the balls. Or, if you prefer, just spray a 13″ x 9″ baking dish and make it into a loaf. Sometimes I don’t feel like making the extra effort so that’s what I do. I love the fact that it’s only 5 ingredients, okay, 6 if you count the salt. 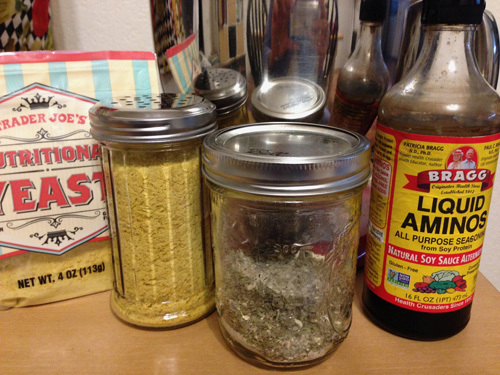 I count my Italian seasoning mix as only 1 ingredient because it’s pre-made so I always have it around. I usually make 21 meatballs that takes up 2 pans. You could cram them into 1 pan, but I wanted to give them plenty of space all around to cook evenly and thoroughly. I’ve shared this recipe with friends, patients, and even on Facebook LIVE! See video link below ;-) Everyone surveyed said they were surprised at how good they tasted. And that certain members in their family liked them better than any other meatball/loaf recipe they’d had before. (I know how they feel!) So, I’m hoping you’re no exception and that you TOTALLY and ABSOLUTELY LOVE these meatballs. As my grandmother, Concetta, used to say to us at the table with palm up, fingers touching…MANJA! MANJA! (EAT! EAT!) I hope you do! Preheat oven to 350 degrees. In a large bowl or mixer on the lowest setting, blend all ingredients well, about 1-2 minutes. Form into meatballs or shape into loaf. Spray pan with cooking spray. (please don’t use canola or vegetable spray as they are very unhealthy!) 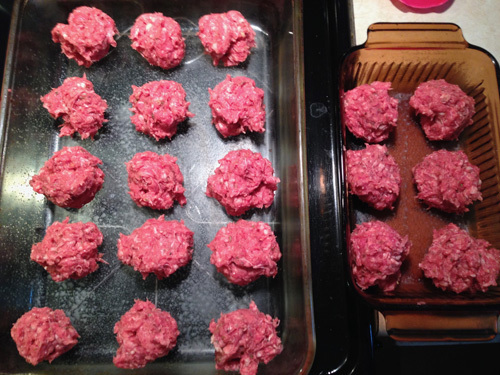 Meatballs: bake for 10 minutes then roll them over and bake additional 10-15 minutes, or until done. Loaf: bake 20-25 minutes or until done. These are so good that you won’t need ketchup or BBQ sauce, but you can if you want to. However, a little marinara sauce is always acceptable. * DIY Italian season mix Fill a glass container with the following: 2 Tablespoons dried basil 2 Tablespoons dried oregano 2 Tablespoons dried rosemary, crushed 1 Tablespoon dried marjoram 1 Tablespoon garlic powder 1 Tablespoon onion powder 1 teaspoon ground black pepper I double the batch so I always have some on hand!